After I’ve pinned out my fabric and smoothed it all flat, I begin to baste the layers together. 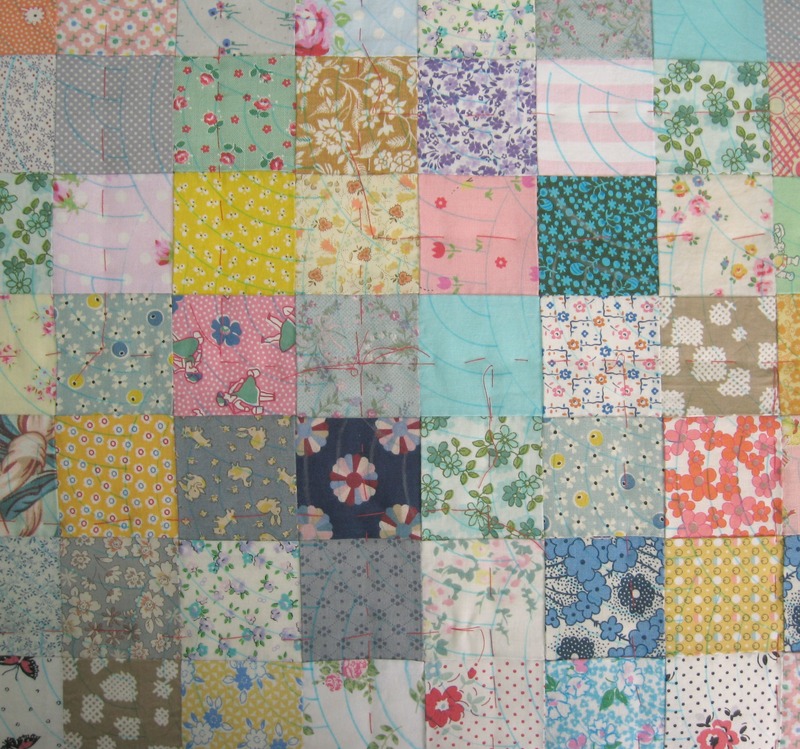 Basically this is just tacking the layers so they are held together while you quilt them. 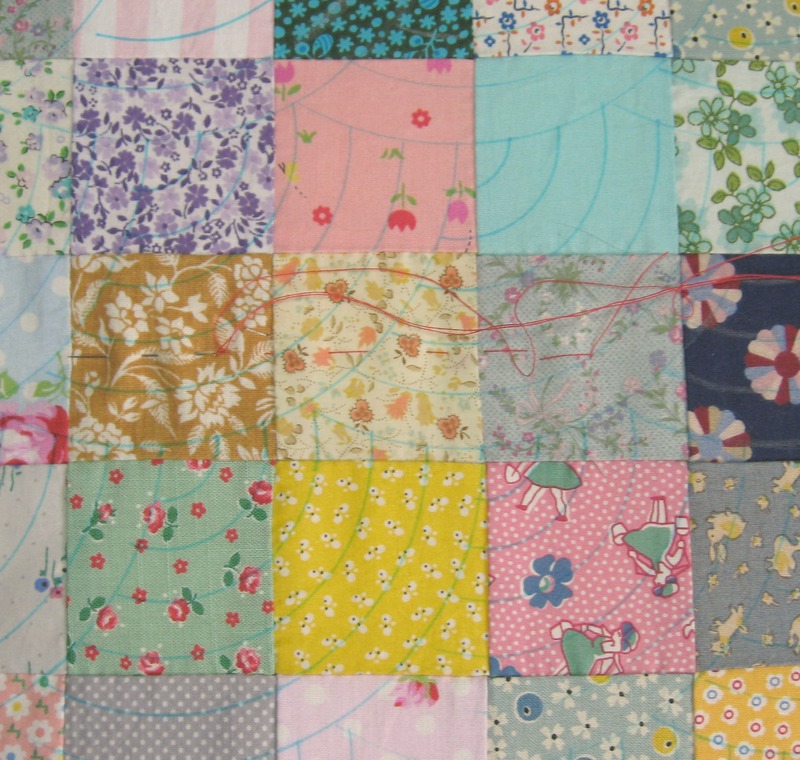 Start off in the middle of your pinned fabrics (from here on I’ll refer to it as your “quilt”), I prefer to use a long sewing needle and some tacking thread in a contrasting colour to my patchwork. 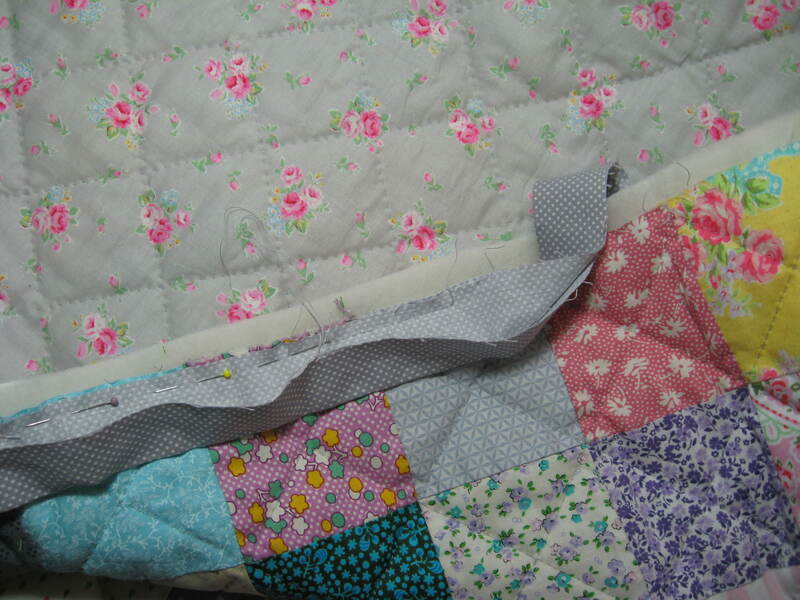 Make a couple of back stitches in the centre of the quilt, you should feel the needle go through the fabrics, and then make a line of stitches from the centre out towards the side. 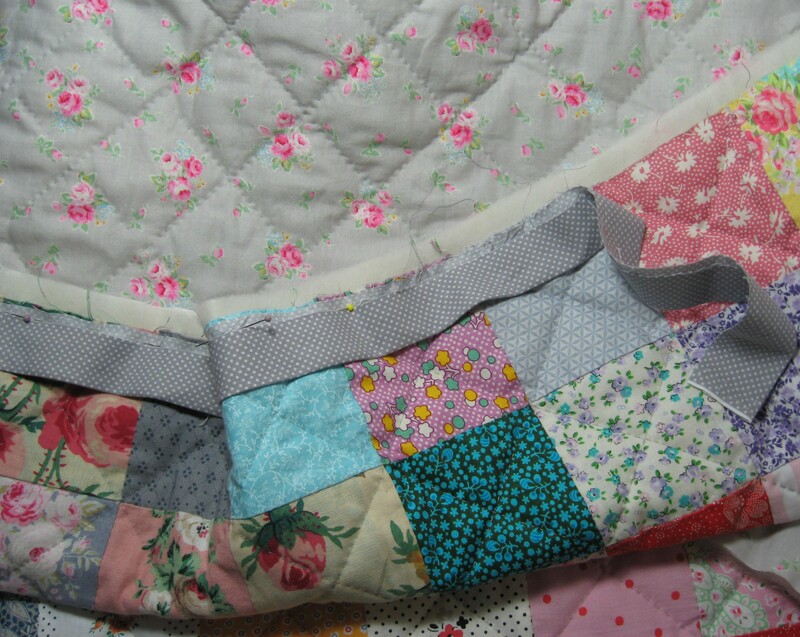 Work the stitches along the extra wadding and extra back fabric so you’ve tacked right to the edge of your “sandwich”. 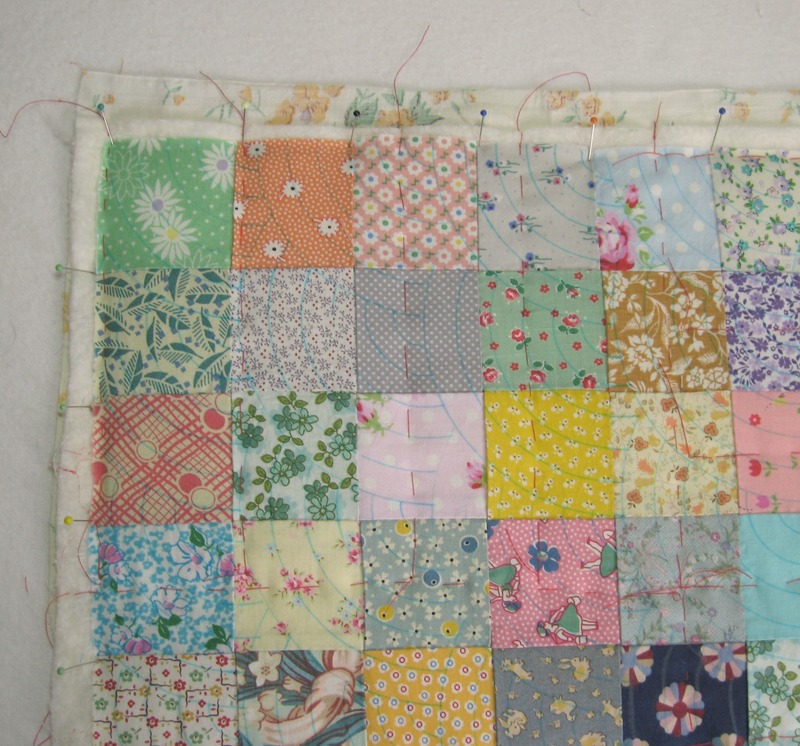 Rotate yourself round so you are now working on the next side of your quilt, again make a couple of back stitches and baste/tack out from the middle to the next side. Do the same thing for the next two sides. 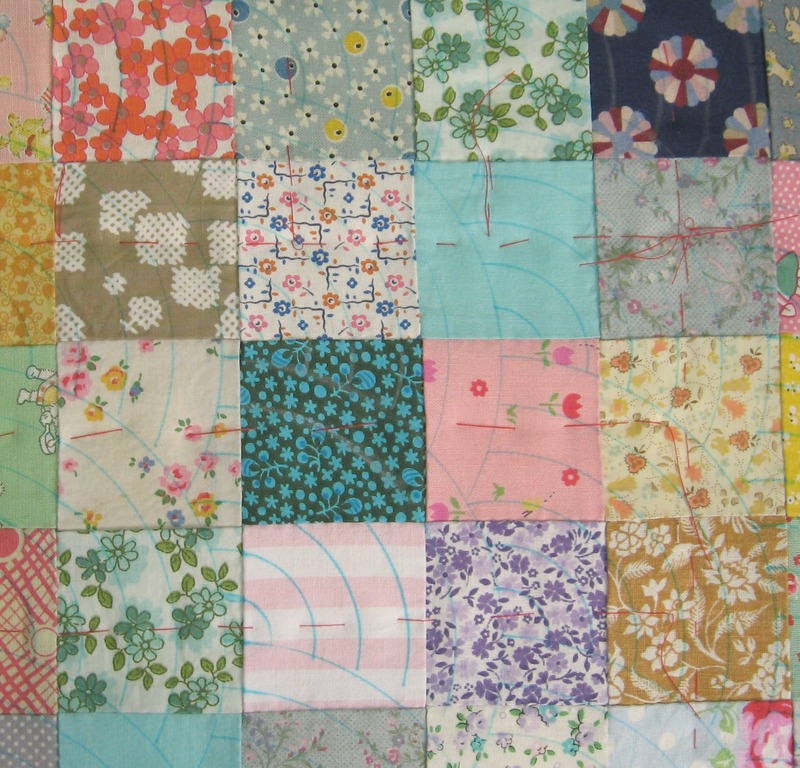 Your quilt is now divided into four sections. Baste each section in turn, work your way down the central line each time and tack out towards the edge in a straight line. The stitches themselves tend to be about half an inch to an inch long and spaced about the same distance apart. 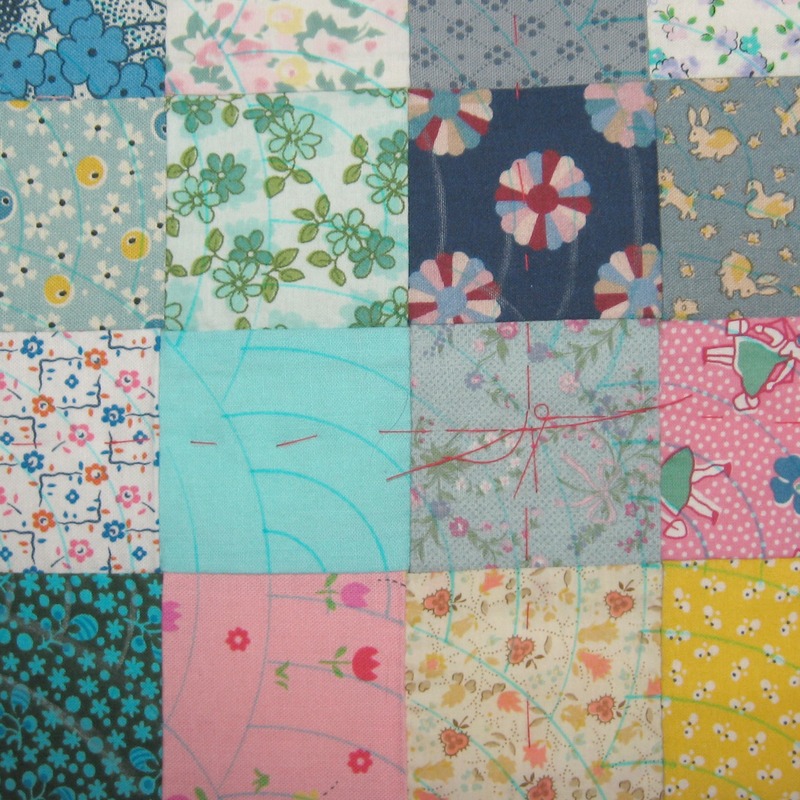 If you are looking at your quilt top from above imagine it is cut into 4 sections, top left, top right, bottom left, bottom right. Top left and bottom right, the lines of basting will want to run horizontally, top right and bottom left, the stitches will want to run vertically. Once all the basting has been done (and for a big quilt this can easily take some hours, it’s really easy to start leaving bigger and bigger gaps but try to keep the basting lines at about 4 inches, it does make for better quilting as your layers of fabric won’t be able to move about), you’ll need to carefully un-pin the quilt from the carpet and gently lift the quilt up from the floor. I say gently because inevitably you’ll have a few carpet fibres trapped, snip the tacking underneath where the basting has trapped the carpet fibres, lift up the quilt and then tack over the section you’ve cut. Generally I find a couple of back stitches are enough. At this point your “quilt” will actually look quite quilty as the lines of basting/tacking look like giant quilt stitches. When you are working on the carpet it is a good idea to get up every so often and do a few stretches so you don’t end up with bad knees or a bad back, I tend to put on some music and do a little workout for 5 minutes before starting again…. (I find the theme tune to something like Cagney and Lacey great for moving about to). 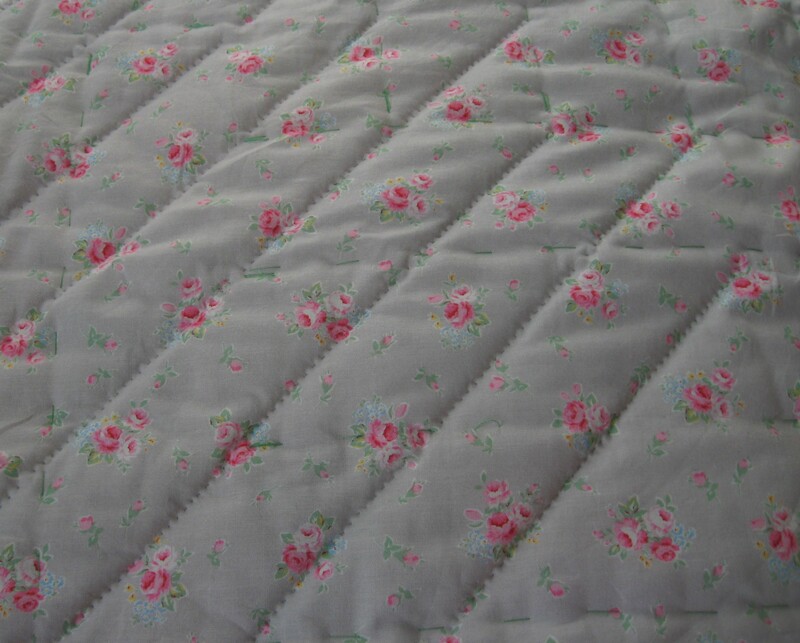 If you don’t have a carpet where you can pin your fabric layers out and instead have a wooden floor I believe you can use masking tape to secure the quilt, however this isn’t something I’ve tried myself so I’m not sure how well it works or if when you sew the lines of basting would the needle would scratch the floor? 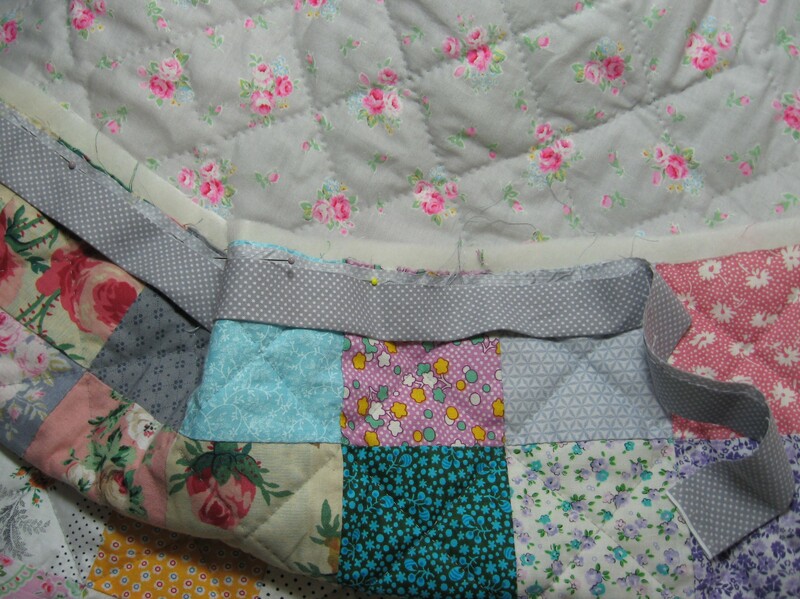 Another option to sewing the layers (which I guess would be better if you have a nice wooden floor) would be to use special quilters safety pins. They are slightly curved (like baby nappy pins) and can be used instead of basting. I’ve not used them myself as I prefer to baste by hand but I’m sure your local quilting shop would be able to advise you on what they are like to use.